If you recall, we first got acquainted with iOS 5 in May after downloading the developer preview, but how does the final release stack up? And does it have the chops to compete with the latest from Mountain View and Redmond? After drudging through seven betas, we're ready to conquer all that the final release has to offer, so join us, if you would, past the break. 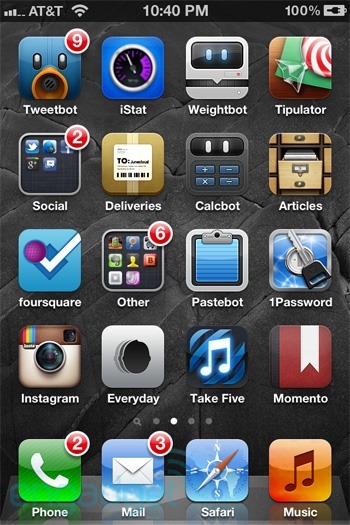 If you were expecting the fifth release to bring forth a visual overhaul, you're going to be sorely disappointed by iOS 5. Sure, there are some visual differences -- e.g., rounded switches, which were previously square, and a little less shadow around message bubbles -- but by and large this is the iOS aesthetic you know and either love or hate. Just because iOS' looks haven't changed radically, that doesn't mean significant work hasn't gone into replacing core components of the operating system. 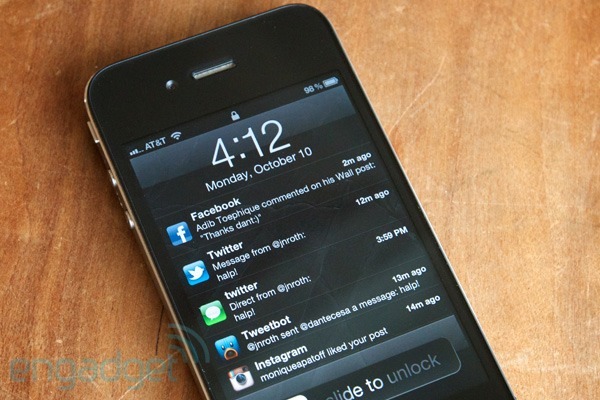 Take notifications, which have been redesigned from the ground up -- a change that couldn't have come sooner, frankly. Gone are the workflow-breaking modal alerts that we've endured since 1.0, replaced by something Apple calls the Notification Center. Instead of interrupting the front-most task, incoming alerts now present themselves with an unobtrusive banner that cube-flips from the top of the device. Functionally, notifications still work the same way, meaning you have two options for interacting with them: you can either address or ignore them, which will either whisk you into the appropriate app or relegate those alerts to an off-screen notification drawer. If this sounds familiar, that's because it is. Cupertino's implementation is very similar to how notifications work on Android. And just like Mountain View's system, that drawer of notifications is revealed with the same downward swipe gesture. Once you do that, notifications are split by app, and further organized by time or whatever metric makes sense to you (naturally, you can customize the order of these notifications by playing around in Settings). From here, you can tap a notification, which opens the corresponding application and subsequently clears all alerts in that category. Otherwise, you can dismiss the entire swath of notifications by tapping the "x" across from an app's name. Among the notifications, you'll also find interactive weather and stocks widgets -- which we presume is Cupertino's answer to the naysayers who've always wanted icons in the springboard to reflect more than sunshine and 72-degree temps. Stuffing this (location-aware!) info into the Notification Center makes more sense, as you can now glance at it any time, as opposed to jumping to and from the springboard. As of now, third-party apps don't have the luxury of placing widgets in Notification Center, which is a shame -- hopefully we'll see this opened up by next year's release. Another thing you should know about the notification drawer is that it's intentionally tough to open when you're doing something full-screen, such as playing a game or watching video. In these cases, the gesture to open the drawer must be replicated twice, which eliminates haphazard openings -- say, when you're slicing your way to a high score in Fruit Ninja. So does it work? In a word, yes -- it's certainly far better than its antiquated predecessor (which, curiously, still lives on in Settings, where it's enabled for phone alerts and can be re-enabled on an app by app basis). And yet, we can't help but wonder why Cupertino stuck with the old design for four years before providing us with this. Maybe we were expecting something more radical -- say, notifications that sync across devices -- but we're glad it's here, and boy does it make iOS a whole lot more livable. We'll need an iPhone 4S to play around with Siri, so until we get our grubby paws on one, there's unfortunately not much to see here. We can't help but note that Siri is the final evolution in a line of Apple assistants that began almost two decades ago. We fondly remember scribbling sentences into Newton's assistant and watching it decipher them into commands and judging from what we've seen so far, Siri should be all that and then some. We'll update with impressions as soon as possible. 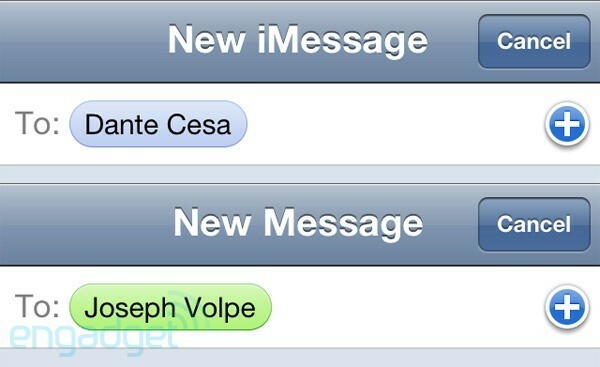 Free texting apps, prepare to meet your maker. 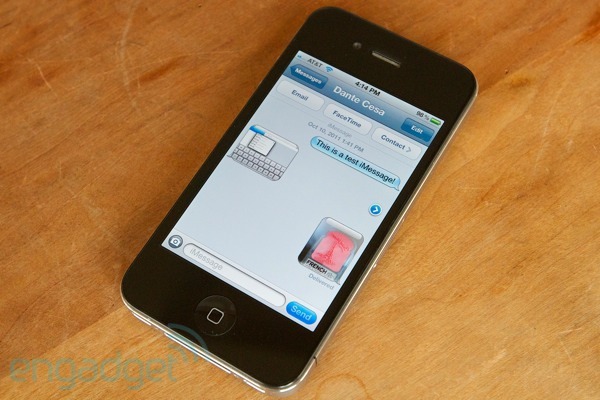 iMessage could be the progeny of the old Messages app and BBM -- except they both agreed to not use the latter's ghastly PINs, which are oh-so 1999. The end result here is a messaging app that seamlessly takes the reins from its predecessor, but allows you to skirt messaging fees when chatting up other iPhone / iPad / iPod touch users who also have iOS 5 installed. It's not an earth-shattering concept in and of itself; its brilliance lies in its sleeper execution. 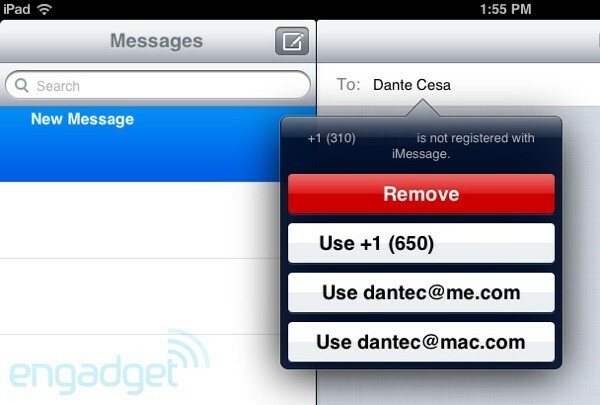 Messages are composed just as before, except if the recipient has a phone or email registered with Apple, the device steps around messaging fees. If not, your iPhone will gracefully scale down to SMS (or MMS if you're slinging more than just text) to relay your prose. It's dead simple, and frankly a breath of fresh air over futzing with third-party apps or expending time and effort in telling friends you've switched to a new (Google Voice) number. So how does the behind-the-scenes magic work? Upon completing the "To" field in the new message, a query is sent to the mothership asking if the recipient supports iMessage. If the receiving party can, their contact (and subsequent message) bubbles are garnished in blue. If not, they'll appear green. From there on out, messaging is just like it's ever been, except that sending both iMessages and conventional texts happens a lot faster than on previous versions of the OS. And because iMessages are sent over data and not the traditional SMS channel, you can send them gratuitously even when you have WiFi access, but little or no cellular connection. But what if you're messaging someone and you don't know what email or phone number has been registered with Cupertino's servers? Magic, apparently -- when we tried texting a colleague's Google Voice number (which wasn't recognized by the service), our iPad suggested a phone number and an email that was. 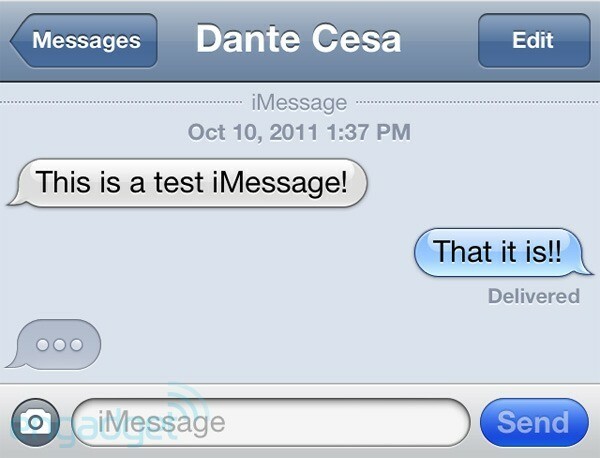 It's that kind of attention to detail that's always made iOS shine, and iMessage is no exception. It's also an innovation we welcome with open arms -- after all, texting charges are egregiously high and besides, how often do you see a device and / or OS maker take aim at the carriers that feeds it? While you won't be able to go entirely text-free (at least not until Apple opens up the protocol to others), we have to give Apple props for its audacity alone -- tip of the hat to you, Cupertino. Another marquee feature in this year's release is iCloud -- a free, revamped version of MobileMe that brings some significant add-ons. Mail, contact, calendar and bookmark syncing all remain essentially unchanged -- apart from their new iPad-esque look on the new site icloud.com. 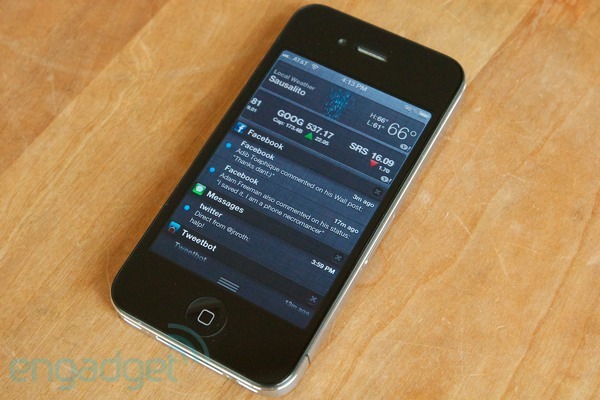 But now, various iOS 5 apps can take advantage of the 5GB free locker on Apple's servers. Updated versions of the iWork suite (Pages, Numbers and Keynote) are one such example, as saving a document in those apps now triggers a push to the cloud, with subsequent pushes back down to other devices registered on the same account. 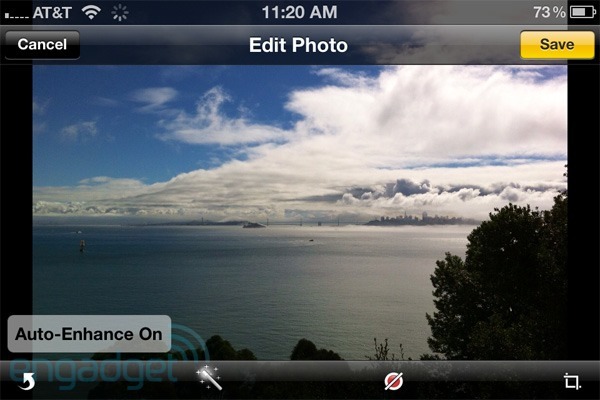 Another iCloud-aware app is Photos, which now syncs the camera roll across all registered iCloud devices. It's worth noting, too, that photos slung across iCloud don't count towards your storage quota. Instead Apple's servers will only keep the last 1,000 pictures taken in the last month -- whichever milestone you hit first. As for the syncing itself, it's pretty much invisible. 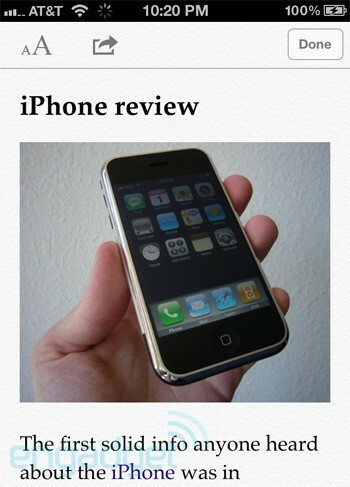 Documents and photos were flung across our iPhone 4 and iPad almost instantaneously, without any effort on our part. While iCloud in its current incarnation is nice, we're more stoked for what it could bring in the near future as developers begin to take advantage of that storage locker. In baking this kind of functionality into every iOS 5 device, we hope it won't be long before we start seeing the kind of continuous client apps we've always dreamed of. Say, apps that remember state across devices and the like. Hopefully we aren't too far off from such wizardry, and it shouldn't take long for developers to wow us with things we've never even thought of. 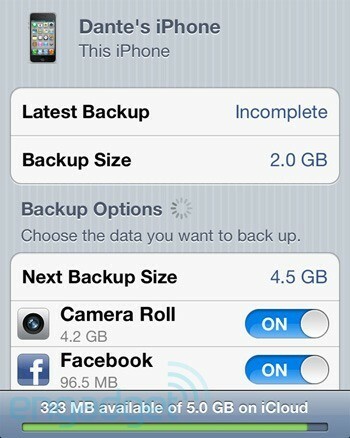 The service also allows iOS 5 devices to back up into the cloud, against that free storage. But be warned: if you're coming from a previous iOS device that 5GB won't go a long way -- especially if you're got over a lot of pictures in your camera roll. You can, of course, fine tune what gets backed up in the Settings app, but having to pick and choose what makes the cut seems to defeat the whole purpose of, you know, backing up. Seems like the 10GB, 20GB or 50GB worth of additional storage might be a more popular choice than we initially thought. The final piece in this makeover is iTunes in the cloud. It's also the least spectacular, as its been available to iOS 4 devices since the June's WWDC reveal and, let's face it, enabling users to redownload content they've already purchased isn't nearly as tantalizing as other features the service has to offer. Still, it's a nice gesture, and could certainly prove useful when you want an episode of a TV Show or a movie, and are within range of fast WiFi but not your home computer. This year's release brings evolutionary updates to the Camera and Photos apps. Beginning with the former, fans of tactility will rejoice at the ability to now take pictures with the volume up button, in addition to the existing onscreen shutter. But while that sounds great on paper, the placement of the volume button and camera lens on the same end of the device isn't ideal, as it's far too easy to obscure the lens with your fingers when taking photos. Another new feature is the grid option, which overlays a 3 x 3 grid over the screen to help you frame shots and abide by that cardinal rule of thirds. Getting to the camera app is easier now, too, as you can double tap the home button at the lock screen to expose a camera icon for quick access to the app. Most important to photography buffs is the addition of an exposure lock, which you can activate by tapping and holding a section of a photo. In addition to those upgrades related to the new iCloud roll-out, Photos gains some light editing features, such as cropping, straightening, one-touch enhancements, rotation and red eye removal. The first two are particularly fun as you get to make gratuitous use of the pinch to zoom and rotate gestures while you tweak photos to your heart's content. Happily, edits are also non-destructive, so if you've cropped or enhanced and then tapped "Save," re-entering the edit mode later allows you to roll back the picture to its untouched glory. Naturally, these tools aren't going to replace Photoshop, but they've certainly proven their worth in our short time spent with them. 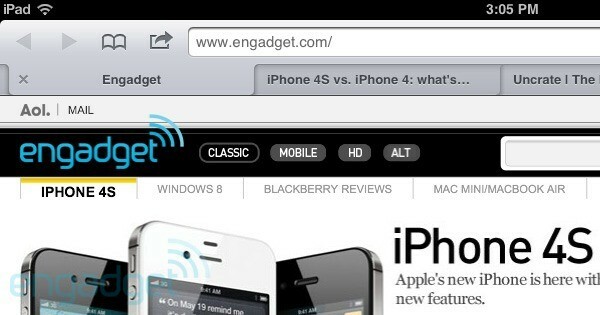 Safari has matured with this release, poaching features from its desktop brethren. For starters, iPad users (finally) get tabbed browsing, which streamlines the previously laborious two-tap hoopla into a single-tap, page-swapping procedure. For novices, it should also cut down on the accidental opening of the same website multiple times. You're still limited to a total of nine, though, but at least now you can reorder them. Other new features are Reader and Reading List. Both carry over from the desktop version of the browser, with the former reformatting content in a streamlined overlay, and the latter helping you save pages to peruse later. If you've ever used Reader on a desktop version of Safari, it works much the same here, stripping content from a page (even stitching multiple pages of pagination in some cases), removing formatting and visual clutter along the way, before presenting it in an easier-to-read overlay. 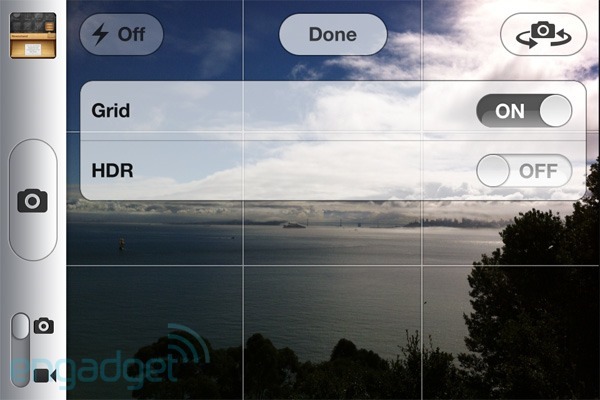 It works, though we suspect you'll make more use of this feature on your iPhone's constrained display than on an iPad. 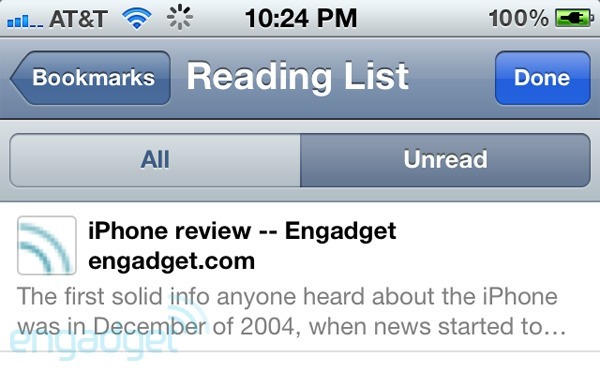 We were less impressed with Reading List, which is really just a glorified set of bookmarks that keep track of read / unread links and sync these across devices. While we like the underlying concept, you'll quickly bore of its constricting organization and lack of third-party support, especially when compared to something like Instapaper. That, and it becomes infinitely less useful if you don't also use Safari on the desktop. Twitter integration hasn't changed much since when we first played with it back in June. If you're not up to speed, the Share icons littered throughout Apple's stock apps now feature a "Tweet" button which brings up controls for propelling photos, links, et cetera into the Twittersphere. To activate the feature, you'll have to enter your log-in credentials in the Settings app as a one-time setup. Apparently, those credentials will also be used by future third-party Twitter apps as-well, should their developers choose to support it, meaning single sign-on goodness for all. Just make sure you don't have the volume set too high while composing those tweets, as you're likely to be startled by a loud whistle noise that'll sound after you hit send. 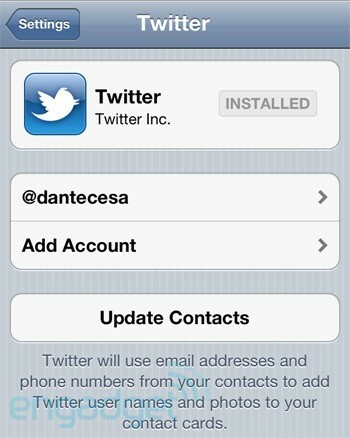 From Settings, you can also match Twitter contacts with those in the Phonebook. Which sounds great on paper, but we have to say, it would be a lot more useful with (cough, cough) another social network? We certainly recall seeing builds of the OS with Facebook in the Settings app, so whatever the grudge between Cook-Zuckerberg, let's just bury the hatchet. Please? After having our iPhone 3G brutalized by iOS 4, we were curious as to how previous-generation hardware would fare with Cupertino's latest OS. 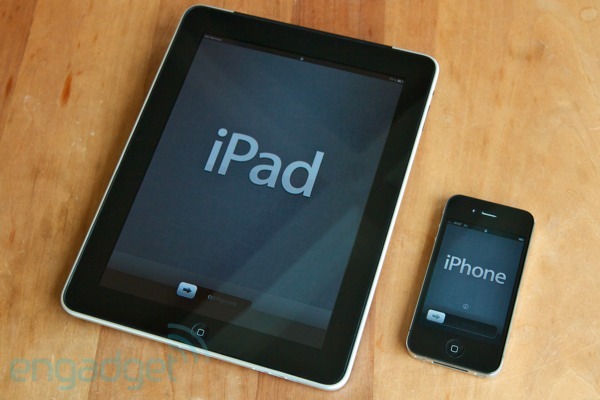 In the case of the iPhone 4 and the iPad 2, iOS 5 made these devices feel as snappy as ever. Transitions were smooth, apps loaded quickly and we never felt like new features overwhelmed our device. On the original iPad, much of the same applies. To be clear, iOS 5 didn't make our original iPad run worse than it does on iOS 4, but if you've ever used a first-gen iPad you know it has some obvious RAM limitations, and iOS 5 certainly won't be the cure-all you've been waiting for. That said, the original iPad is usable with Cupertino's latest release -- something we were unable to say during our iPhone 3G's transition to iOS 4. Combined with iCloud, this snazzy new setup assistant means iOS devices no longer have to be tethered to a computer for setup. From then on, iOS 5 devices sync over WiFi if plugged in and iTunes is open on the host computer. It's here and works. 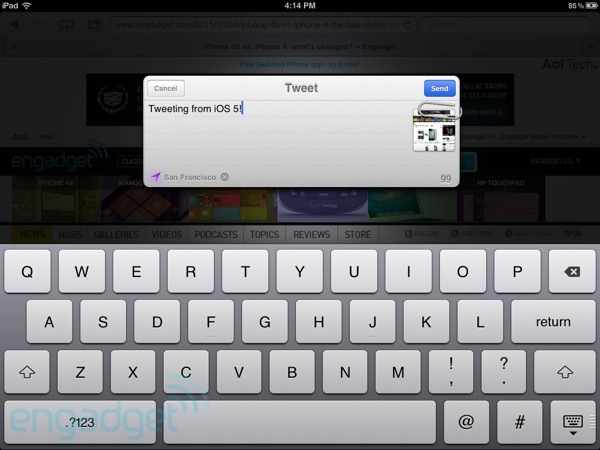 iOS 5-toting iPad users can enable it by either dragging the keyboard upwards from the bottom right corner, or by pulling it apart with two fingers. The small keys take a little getting used to, but more choice is better than none, we suppose. You'll also notice some interface weirdness in some apps when you're using the split keyboard -- we're looking at you iMessage, and your vast expanse of grey drab. Remember when you had to download an entire 500MB image of iOS, just to plug a security vulnerability? Updates for iOS 5 will be released in delta form, meaning only the parts that change are what has to be downloaded. And because they're smaller, they now come to you over the air and can be installed sans-PC. Second-generation AppleTV owners get video mirroring of their iPad 2s without wires. To be verbose, it's the entire UI, not just select content (like a photos or a video) like on all other AirPlay-enabled devices. Think of it as the wireless equivalent of the HDMI or VGA accessory cables for the iPad 2 and something to watch when game developers start exploiting it. 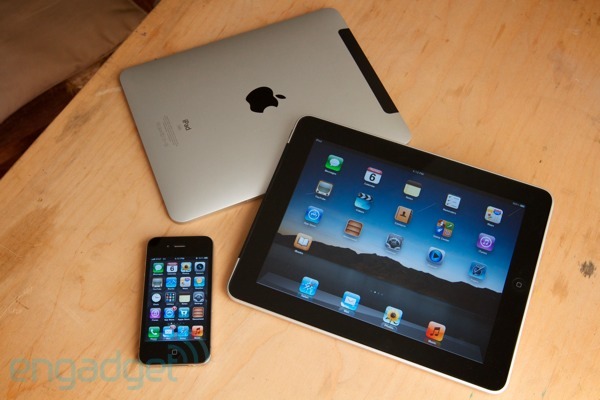 You'll recall that developers could enable these on the original iPad back in iOS 4. Four- and five-finger swipes are the name of the game here, allowing you to jump to and from apps without double tapping the home button or making a roundtrip to the springboard. Flags and rich text editing make an appearance in this release, but we were most impressed by the gesture that reveals mailboxes when you're using your iPad in portrait mode. Just flick right from the left edge to make managing emails in portrait mode, oh-so much easier. It's not a looker (maybe we've been spoiled by apps like Flow or Orchestra), but we suppose it gets the job done. The killer feature however, is the location-based alerts, which can be triggered upon arriving or leaving certain places. When combined with Siri, game over. It's just a centralized place where all your favorite magazines and periodicals live. Those zines have also been relegated to a new section of the store and also gain the priviledge of new updates that download in the background. Android users have been enjoying voice-to-text translation for what seems like eons, and with iOS 5, Apple also supports the feature. However despite being demoed at the "Let's Talk iPhone" event it would appear the feature is only available to iPhone 4S owners -- we'll add impressions here when get to play with it. The $24.99 service debuts "late October," so we'll circle back then with impressions on Apple's foray into music subscriptions. While the distance between iOS and its contemporaries has shrunk, Apple's baby is certainly more polished and feature-complete than it ever has been. With gripes like notifications and wireless sync behind us, Apple's been able to hone in on breaking new ground with features like Siri, iCloud and iMessage -- all in an extremely refined way. And that's when it hit us. Other than turn-by-turn navigation, more multitasking APIs and some delectable widgets, there isn't much, headline-wise, left on Apple's hit list for iOS 6. The OS that once was functionally limited, yet smooth and pretty, has blossomed into something that is powerful and yet also slick. It's certainly not the OS for everyone, but from a macro perspective, you really can't argue with its laser focus on attention to detail. And with Mango already ripe, it's your move, Ice Cream Sandwich.